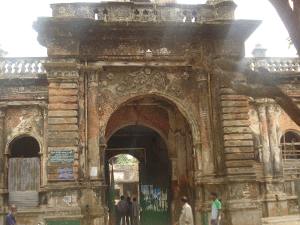 Muktagacha Rajbari is one of the oldest zaminder houses in Bangladesh. It is situated at Muktagacha thana in Mymensingh district. It is an extensive palatial complex sprawling over at least 20 hectors of land. The whole area is full of many ponds, temples, palaces and out buildings. Of them only a part is now being protected by the Deptt. of Archaeology. The protected area is an east facing enclosed precinct studded with gateway, garden, reservoirs, residential complexes, temples and several other ancillary buildings. The architecture of all the buildings simulate Indo-European neo-classic ethic. They were built by different members of the Muktagacha zamindar family in different time. Some are still being used for different purposes. The protected part is called ‘Char Ana' locally. It may hardly be dated in the early 20th century A.D.
Time has left its mark on the structure and all the precious dιcor inside and outside the palace are in a poor condition because of lack of proper care.